Within easy reach of all Battleboro, North Carolina attractions, off I-95, this hotel is an 8 minute drive to the Belmont Lake golf club, Golden East Crossing Mall, North Carolina Wesleyan College and Dunn Centre for the performing arts at Rocky Mount, while the Rocky Mount sports complex is just another 5 minutes beyond. Stonewall Manor historic home (less than a 15 minute drive), set in a superb oak grove on the banks of the Tar River, was the heart of a large antebellum plantation and is on the National Register of Historic Places. 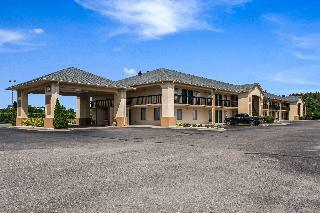 This is a pet-friendly hotel, with seasonal outdoor pool, onsite copy and fax services, meeting room and free wireless high-speed internet access, near several restaurants and entertainment venues. Guest rooms all have work desks, coffee makers and cable television, while guests may choose to opt for a room with whirlpool bathtub, fridge and microwave.